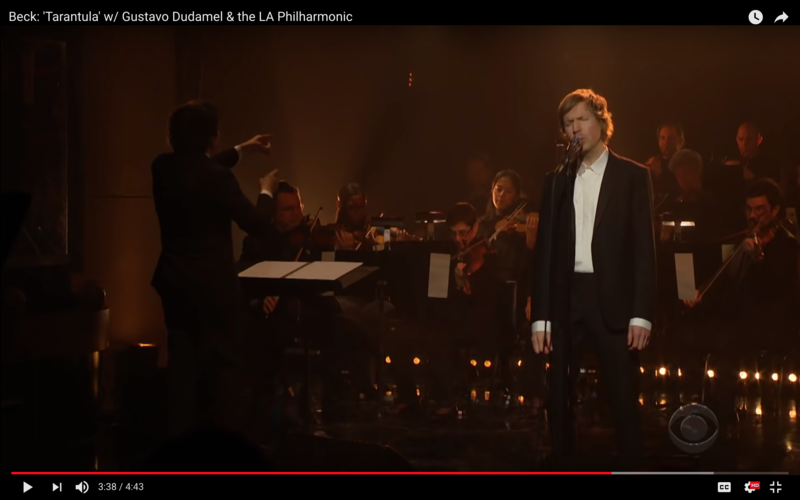 I know some of you didn’t get a chance to see Gustavo Dudamel and the Los Angeles Philharmonic join Beck perform his song, “Tarantula,” on “The Late Late Show.” Or even if you did, you might want to see it again but didn’t record it. Fear not, dear readers. James Corden and crew posted the performance on YouTube. Yet that doesn’t mean it’ll be up forever, if prior precedence holds . . . yeah, I’m looking at you, Stephen Colbert. In case you forgot: LA Phil brass players, Principal Timpanist Joe Pereira, and Maestro Dudamel were on his show in 2016, and their performance of Copland’s “Fanfare for the Common Man” was briefly on YouTube, until it wasn’t. No explanation for its disappearance was given, though my guess is that Copland’s work is not in public domain and CBS and/or Mr. Colbert didn’t want to pay for (or didn’t get) permission to keep the recording out there. So watch the video below and enjoy the performance online — while you still can. Tags: Beck, Gustavo Dudamel, James Corden, The Late Late Show. Bookmark the permalink.